Review: Last May, Marvel’s The Avengers roared onto screens around the world becoming the crown jewel of a tent pole franchise that Marvel Studios has been carefully planning for quite some time. If everyone’s being totally honest the thanks should go to Iron Man and Iron Man 2, films which bore the weight of lofty expectations while other Avengers-themed material got underway. Though subsequent films like Captain America: The First Avenger and Thor did solid box office, they couldn’t hold a candle to the kind of money that the Iron Man films brought in. Of course, when Marvel’s The Avengers was released it set box office records a blaze, becoming the first film to gross over 200 million dollars in its opening weekend. Now it’s a year later and Phase II of Marvel’s film series begins with Iron Man 3 and if this is any indication on what’s to come with Thor: The Dark World releasing in November and Captain America: The Winter Soldier releasing in 2014…it will be nothing but blue skies from now on for fans of these superhero films. A lot has changed in a year for our Iron Man, aka Tony Stark (Downey Jr.) as he battles nightmares and paranoia brought on by the events that took place in Marvel’s The Avengers. (This is a case where having some knowledge of the previous films is nearly required to get the most out of the story that Iron Man 3 is putting forth.) While his relationship with his former assistant now CEO Pepper Potts (Paltrow) has moved forward, he struggles with being vulnerable in the face of protecting the one he clearly loves. Opening with a brief flashback to 1999 where we meet Aldrich Killian (Pearce, Lawless) and Maya Hansen (Hall, The Awakening), the film lays a groundwork for a plot of revenge that will take our hero on a difficult journey of redemption as makes a personal mission to take down a terrorist called The Mandarin (Kingsley, The Dictator, in a role that provides several nicely unexpected twists). Revealing anything more would spoil some of the surprises that new director/screenwriter Shane Black has in store for audiences. Working with Drew Pearce, Black skillfully takes everything that we know about Stark from the previous films and gives the character a hefty shove forward into uncomfortable territory – and it works quite well. Black first came to attention by penning such hardscrabble action films like Lethal Weapon, The Last Boy Scout, and The Long Kiss Goodnight (not to mention The Monster Squad) so he feels at home with melding the action-comedy genre to fit Downey Jr’s talents (the two previously worked together on Kiss Kiss Bang Bang). Like Iron Man 2, having less screenwriters makes the film feel like it’s one voice rather than many that are bringing ideas forth to keep our characters growing and evolving. What I enjoyed about this film (and all of Iron Man’s appearances on the big screen) is how willing everyone is to let Tony Stark be as irascible as possible. His relationship with a fatherless boy (Simpkins in one of the better child performances lately) in the films mid-section is refreshingly off-the-cuff and very in line with how Stark would relate to an adult that crossed his path the way this kid does. That’s what makes Downey Jr. so perfect for this role – he’s able to make an unlikable character very likable without making sacrifices. 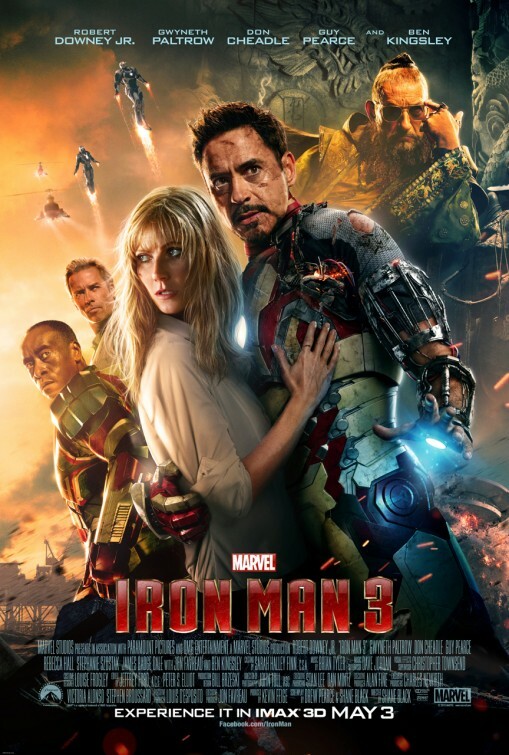 Iron Man 3 marks a turning point for Paltrow’s character as well – it appears that someone finally took note that Paltrow can do more than just play the straight-woman to Stark’s childish behavior because her role is amped up here to good effect. Pearce looks mighty buff in the arms but old in the face and is a nicely smarmy villain. Hall is, unfortunately, typically bland and Cheadle does the most with what is still a sadly underwritten role. Director of the first two installments, Favreau literally sits this one out as his character (looking like a meatball in a too-small suit) is laid up for most of the film. Nice turns from James Badge Dale and Stephanie Szostak as fiery henchman top off a decidedly eclectic cast. What sometimes bothered me about the movie is that we all know by now that Iron Man has some friends in super places yet no one shows up to help him out as he goes through a particularly rough patch (spoiler alert: Samuel L. Jackson doesn’t appear in this one as Nick Fury). I kept waiting for someone to pop in and lend a hand but as the movie has a theme of isolation it winds up working well that Stark has to go it alone. Though it can’t match Marvel’s The Avengers for sheer jaw-dropping action sequences, it comes close with a finale set on an abandoned oil dock that seems right out of a Lethal Weapon movie. Wildly ambitious and easy to follow, it’s quite overwhelming…especially in 3D which for the rest of the film doesn’t add much to the proceedings or your ticket value. What it does add is parting excitement as you leave the theater because the way that things are left the movie can go in any number of different ways. With a Captain American and Thor movie set for release before the next Avengers movie in 2015, who knows if we’ll see Tony Stark again for a few years…but based on the series famous end credits of cameos (this is no exception…please stay until the end) I bet Stark will pop in again soon.